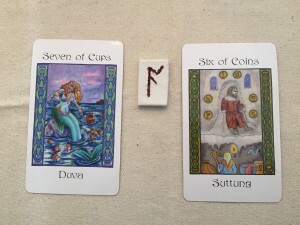 Today’s Draw: Duva/Seven of Cups; Ac; Suttung/Six of Coins. Choices, choices, choices! At the back of your mind are all the practical considerations, but the conscious part of your brain is distracted by all the shiny objects. So many possibilities! So much potential! Why choose? DO ALL THE THINGS! Whoa, there, Nelly. Yes, you can do ALL THE THINGS, but not all at once. There is only one of you, and you can do only one thing at a time, and there are only 24 hours in a day. Before jumping in from a sense of excitement, take some time to sort through the options. Excitement is good, inspiration is good, but you do need to acknowledge practical considerations. Do not create unnecessary obstacles, but do be honest with yourself about limitations. If you don’t acknowledge them, you can’t address them. 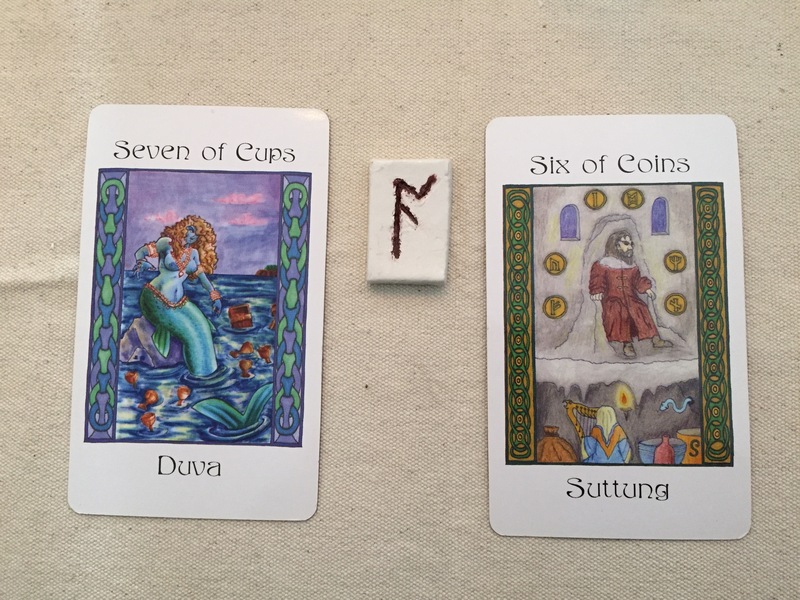 Duva’s card shows seven cups and a treasure chest floating in the water with Her. What is in the chest? What is She offering? Do you have the courage to look inside? Duva’s message is to look around with fresh eyes–what we need may be right in front of us, but we have to look for it. Angrboda reminds us that we already know the answers, we know what our best choices are. Enjoy the sparkly lights, but when it comes time to actually choose, look past the appearance to see things as they really are–including yourself. Be honest with yourself about your motives, and examine others’ motives closely. If something doesn’t feel right, pay attention to that feeling. Guard what is valuable; share what you can. You have a lot of options, and more resources than you realize. Choose wisely to live well.